To the sadness of comic book fans of all ages, the great Stan Lee, creator of Spiderman, the Fantastic Four, the X-Men, Ant Man and others, but especially to be remembered as the godfather of Howard the Duck (whose name I wrote in for President in 1980 and proudly wore a T-shirt with his slogan, “Get Down America!”) died today at 95. What a life. 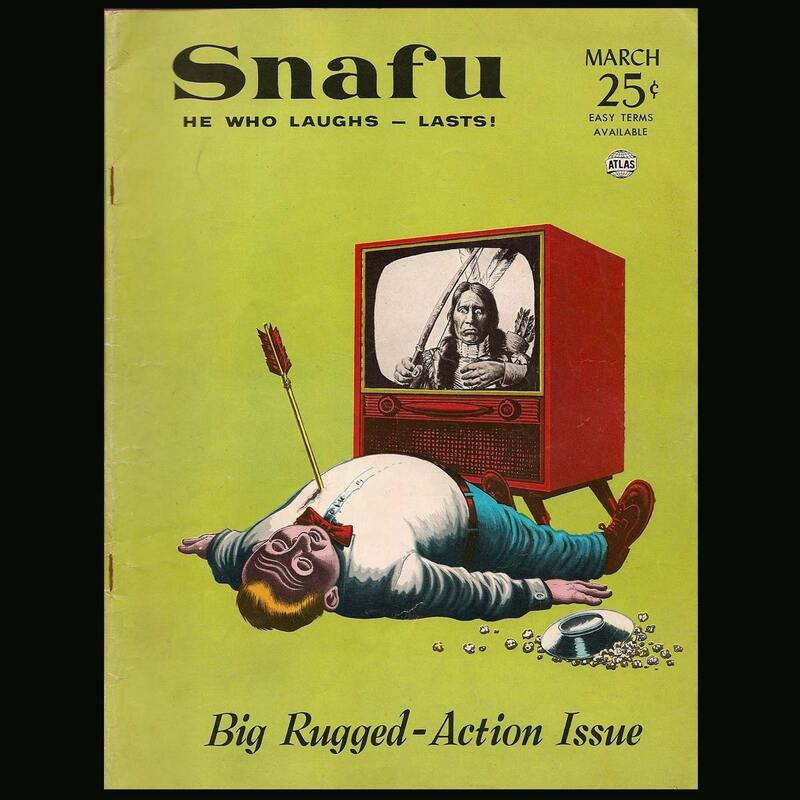 An little known fact about Lee’s publishing history was his 1955-1956 editorship of SNAFU magazine, a competitor of Mad magazine. For three issues this rather more diseased version of the satire mag ran some memorably sick features including the immortal “Forest Fires Prevent Bears” centerfold poster, which featured a rabid, snarling Smokey the Bear charging at the reader holding his shovel over his head like a club while a forest burns wildly behind him. I owned all three copies at one time, scrupulously collected from various memorabilia shows and shops in the mid-1970s. I don’t know what I did with them but they’d be worth a bloody fortune now. I also once owned the original Fantastic Four issue. Also sucked down the tunnel of history. However, I do own the Giant Size Man Thing comic in which Howard first appeared, stumbling through a dimensional warp into the world of the talking hairless apes, which today would be a euphemism for a Trump rally. Speaking of which, I’m sure Stan – an early crusader against racism and bigotry – would have been delighted to have lived one more day so he could have savored Kyrsten Sinema’s victory in the final vote tally for the Arizona US Senate race over that neofascist bovine lout, Martha McSally (a kind of Jan Brewer clone, which some years earlier might have inspired Sam Neil’s question to the head geneticist of Jurassic Park, “You’ve bred raptors?”). Back in the early to mid 1970s Lee took on such diverse hate mongers as Anita Bryant (in an issue of Howard the Duck) and anti-Black racism (in an issue of Sargent Fury and His Howling Commandos). These were territories into which no comic books had previously ventured. Fans of all ages, indeed, Gator. My 17-year-old foster daughter, a HUGE Marvel fan, shed some tears yesterday at this news. But along with the sadness came her delight in the knowledge that the folks making the MCU movies have hedged their bets against Father Time and have proactively filmed the obligatory Stan Lee cameo appearances for at least the next Avengers movie, as well as Captain Marvel, after which point she either wants them to CGI Mr. Lee into subsequent movies, or dress up Deadpool in a mustache and tinted glasses. I’m not sure which would be more awesome, frankly. RIP Stan Lee, you left a legacy for the ages. I usually object strongly to using dead people in movies, commercials,etc. But for Stan I can make an exception. I am sure he would not have objected at all. Unless you put in in a DC Comics movie. I have no problem with exploiting the dead as long as they’re kept well chilled. RIP, Stan. Seems like I’m saying that about too many icons. This is one that my twenty year old grandson and I shared. I texted him my sympathies this morning. Stan certainly leaves behind a huge legacy. 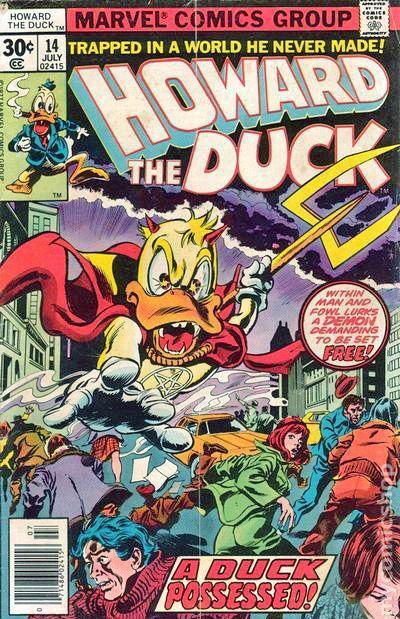 And long live Howard the Duck! I had one of (maybe the very) first Daredevils. When he still had the yellow suit. Ended up with a ton of F4 and the Steranko Nick Fury.All in some landfill somewhere. May his soul Rest in Peace. Thanks Stan Lee for giving us all those superheroes that we love, and can’t imagine our life without. And thanks for helping us to realize our neuroses were cool, too.